Test Data: 1.42 WPDA .82 BF 7.76 LE at 282 Lbs. What an exciting boar. 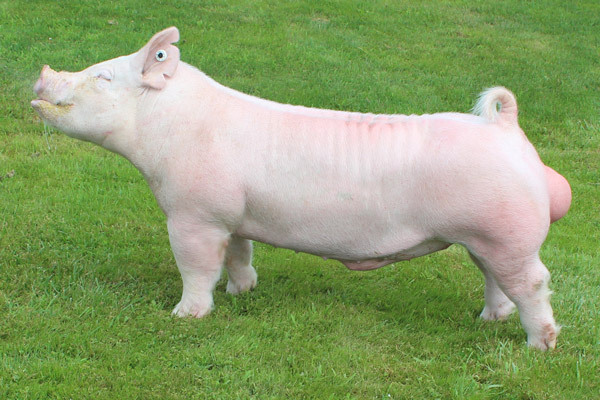 Kevin Ricker's Lab Fancy 87-11 sow is in the pedigree twice. She is the dam of the $15,000 Foundation Female that sold at the 2015 NSTC. Grant purchased this boar from Stohlquist Farm on an online sale this spring. This boar was raised on 12% sow feed until early June. Zero Paylean Zero Matrix. This guy showed in his work clothes and he is flat good. Littermate gilt was the Grand Champion Gilt at the Big Jackpot Show in Illinois in June. Buzz Saw has a tremendous showpig look. He hits us as a great breeding hog. He is so heavy boned and correct on his feet and legs. He is as square built as any I have ever seen. Length of body is good. Levelness of top is great. Thickness of blade and thickness of top is near perfect. He comes at you with lots of power. He tracks wide front and rear. His top is thick and square. His rump is square and full. This guy has one hell of a shot. Tremendous Showpig Look.